The Dividist Papers: Ronny - We hardly knew ye. Ronny - We hardly knew ye. Friends, Americans, Libertarians, lend me your eyes. I come to bury Ron Paul, not to praise him. The good politicians do live after them, the not-so-good should be interred with their bones. The one-two punch of the New Republic article with amplified "Ron Paul Newsletter" quotes, Paul's tepid response, combined with his underachieving performance in New Hampshire has knocked Ron Paul to the mat and down for the count. "If Paul cannot win or even beat Giuliani in New Hampshire, his most promising state, then what hope does he have? His ads sucked... But the freedom movement he helped galvanize is much more than one man. And if we enter a second Clinton era, we will need it as much as ever." " ...he’ll start losing supporters after today because of the combination of his loss and that story, but that muckraking probably only lost him a few hundred people tops in the Granite State. Still not enough to think he could have climbed to 4th. And folks, when you finish with 8% of the vote in the state with the biggest concentration of independents, well, it’s time to rethink whether or not you should be in the race. New Hampshire is tailor made for a Libertarian message, and it just didn’t resonate last night." "...everyone’s favorite GOP oddball – that is except within the Republican Party itself – tanked in the Iowa caucus, finishing a distant fifth and besting only Mr. 9/11, who had skipped the state altogether. Then one of the archeologists digging into Paul’s quixotic background struck a mother lode with the discovery that his campaign newsletters in the early 1990s were filled with bigoted statements... A particular peeve of mine is national candidates who stand zero chance of being elected but stay in a race. While Paul stands for some things that I agree with in the abstract, he couldn’t get elected dog catcher and knows it." "Throughout the evening, I heard a common theme: that the freedom movement has to be bigger than one congressman with a past that keeps climbing up out of the mud to drag him down. Days before the votes came in I hung around outside Murphy's Taproom, the de facto Ron Paul bar in Manchester, and heard college kids and just-out-of college types excitedly talking about what would happen when... Paul didn't win. "Dr. Paul wouldn't want us to give up if we lose this election," said Drew Rushford, excitedly talking with two other out-of-state supporters. "If we give up, then we never supported him at all." So Lew Moore was right -- The Paul party was as exuberant as most victory parties. We just don't know yet what they're celebrating, and neither do they." These writers are prone to be sympathetic to Ron Paul. As am I. New Hampshire was the high water mark for Dr. Paul, for all the reasons they mention. Bottom line, Ron Paul is a fatally flawed candidate. Now, I am a Paul supporter, I sent him some money, I may send him some more, and I am certainly going to vote for him in the California primary. 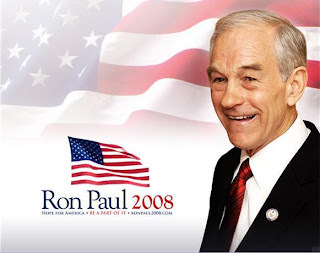 I'd like to see Paul stick it out through super Tuesday - if only to see whether his constituency can be organized into something that can be politically effective in the post-Ron Paul era (which started last night). Along those lines, I have a suggestion for Dave Weigel and other Ron Paul supporters about "what they're celebrating", and what the Freedom movement can do while looking for the right candidate to support. It is entirely reasonable to suppose that the 8%-10% of the vote that Paul garners accurately represents the libertarian swing vote in the US. It is not large enough to elect a libertarian president, and only large enough to be a spoiler as a 3rd party. However, since we have a highly polarized, roughly balanced partisan electorate, It is large enough to determine the direction of American politics, if it can be organized to swing as a group between R’s and D’s. "Ultimately, I see this voting tactic as highly effective, but short-term and self-limiting. Maintaining divided government has real benefits in terms of governance, and the primary benefit of successfully implementing this voting tactic is to move the country toward the objectives outlined in this post. As a side benefit, it could serve to establish the moderate libertarian center as a self-aware, broadly recognized and organized voting block. Objectively, divided government only slows the growth of the state, with no evidence that it can actually begin to reduce it. One way to describe the situation is that the "Divided Government vote" stands down when the "Moderate/Centrist/Libertarian vote" stands up. 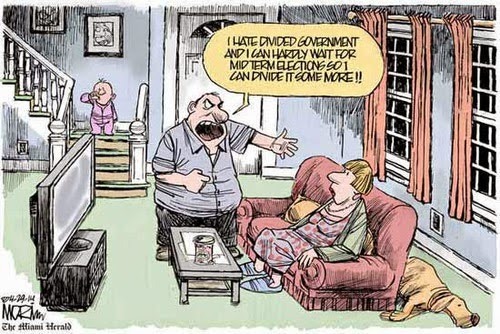 Ultimately, if the divided government constituency is co-opted and eroded because Democrats and/or Republicans are wrestling with each other to prove who are the better, more effective moderate/libertarians, and can prove this to a skeptical, rational, empirical moderate/libertarian swing vote ... well then our job here is done." "Shaping an election outcome one time can be dismissed as a rogue political wave. Shaping two consecutive federal elections is a sea change that cannot be ignored. 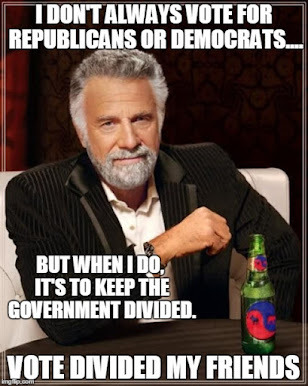 If the libertarian "divided government vote" is shown to swing the 2008 presidential election as it did the Congressional outcome in 2006, then libertarians will no longer be inchoate, their message no longer diffused, and their political clout no longer flaccid. As long as the bulk of the electorate remain polarized and balanced, even a small percentage libertarian swing vote organized around divided government will be enough for libertarians to display the biggest swinging political "hammer" in town." Technorati tags: Democratic, Republican, Ron Paul, libertarian, New Hampshire, 2008 Election.